Ten Pins dice game is the dice version of ten-pin bowling game. The rules of the game make for an interesting play. The game is played for 10 rounds (called “frames”) with objective to score highest to win. The game is played with 2 six-sided dice. Setup: 2 six-sided dice and a scoresheet (such as below). The scoresheet contains 10 columns one column for each round (called “frame”). Each frame has two sections to mark points scored after each roll which are called “bowls”. Last frame (10) has 3 “bowls”. The final score of the player after each frame is recorded in a cell just below the bowls score for that frame. Each frame has two bowls. For first bowl, player has to roll both dice. For second bowl, if available, can only have one die to roll. Players can not roll for more than two times for each frame except last frame. If players roll 2 fives for first bowl, then it is called a strike. Players get 10 points (+ additional points) for it. No second roll is required. Read the rules further for scoring of additional points. If players roll a six for any of the first or second bowl, then its off the alley and they get zero points for that bowl. In case players roll any number other than 2 fives or a six, then they score total of dice numbers for that bowl. If points for first and second bowl together add up to 10 or more then its called a spare and players get 10 points (+ additional points) for this. Read the rules further for scoring of additional points. If player has not scored a strike or a spare in either of the two bowls, then total points for the two bowls are added to the player’s total score at the end of the second bowl for that frame. 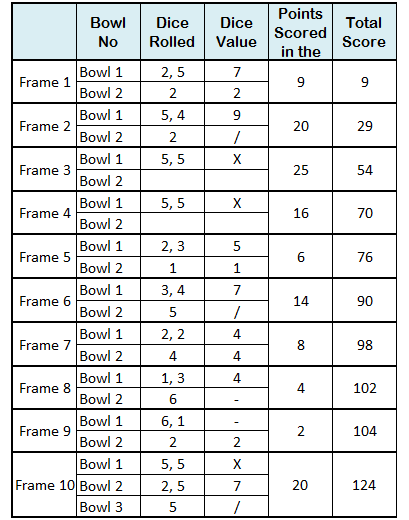 In case player scores a strike or a spare for a frame, then total score for that particular frame can be done only after the first or second bowl of the next frame. If player scored a strike then total will be done after two bowls of the next frame (points for two bowls of next frame (or multiple frames if consecutive strikes are scored) + 10 points). If player scored a spare then total would be done after first bowl of the next frame (points for first bowl of next frame + 10 points) . 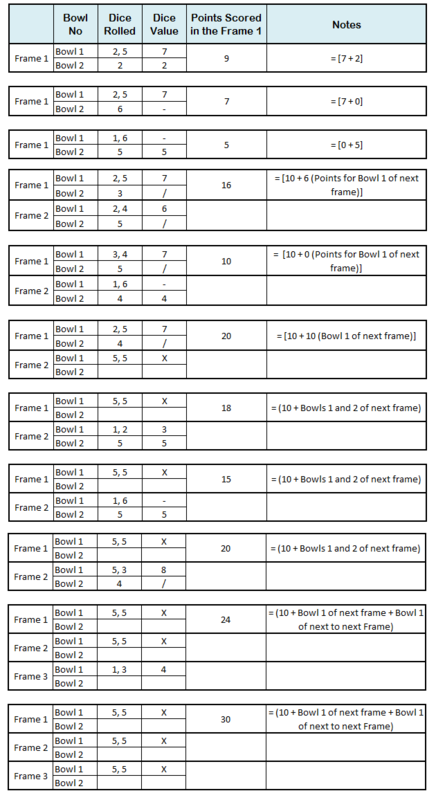 The last frame has three bowls to account for a strike or a spare since there are no further frames to get additional rolls for the strike or spare. In case no strike or spare is rolled, players gets to roll only two times. Roll with a six is marked with a hyphen (–) in the scoresheet. Strike is marked with X and spare is marked with /. Once all frames have been rolled for, the player with the highest score wins the game. 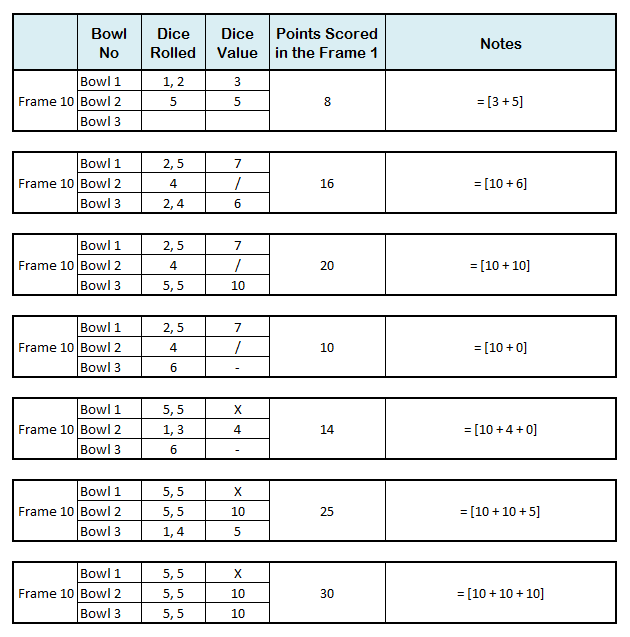 Take a note of dice available in second and third bowl for frame 10 if a strike or spare has been scored. First bowl has 2 dice to roll. Second bowl gets a single die if no strike is scored. Next bowl after all strikes gets 2 dice to roll. If first bowl is a strike and second is not then third bowl gets one die to roll.